Compared to the preliminary version of this chart, we see a large decrease in debt appearing to be held by the United Kingdom, but large increases in debt actually held by other foreign entities. This is due to the role of financial institutions in the U.K. acting as international intermediaries for the interests of other foreign entities. The Treasury Department’s annual revision of this data accounts for the actual foreign ownership of U.S. government-issued debt. We note that some $1,773 billion of the U.S. government-issued debt we’ve recorded as being held by U.S. individuals and institutions as of 30 September 2011 was held by the U.S. Federal Reserve. The U.S. Federal Reserve then accounts for 28% of all the debt held by U.S. individuals and institutions and works out to be nearly 12% of all the nation’s public debt outstanding, as the Federal Reserve increased its U.S. debt holdings by $807 billion during the U.S. governments 2011 fiscal year. Combined, the U.S. government-issued debt holdings of foreign individuals and institutions account for just shy of one-third of all the U.S. government’s public debt outstanding. Board of Governors of the Federal Reserve System. Monthly Report on Credit and Liquidity Programs and the Balance Sheet, October 2011. Table 1. Assets, liabilities, and capital of the Federal Reserve System. Board of Governors of the Federal Reserve System. Monthly Report on Credit and Liquidity Programs and the Balance Sheet, October 2010. Table 1. Assets, liabilities, and capital of the Federal Reserve System. U.S. Treasury Department. Major Foreign Holders of Treasury Securities. Accessed 24 March 2012. U.S. Treasury Department. 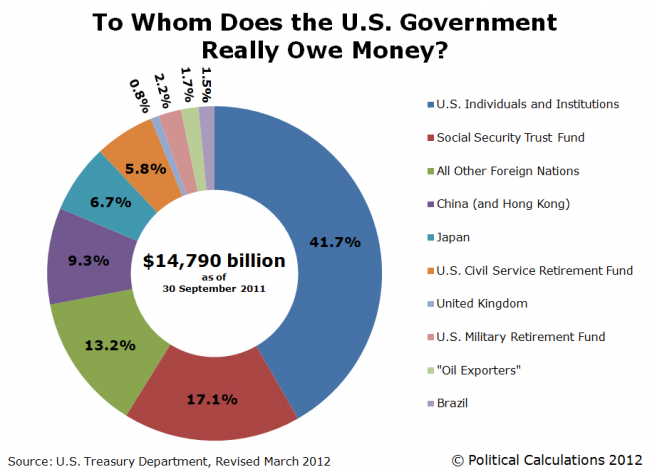 Monthly Statement of the Public Debt of the United States, September 30, 2011. Table III – Detail of Treasury Securities Outstanding, September 30, 2011.